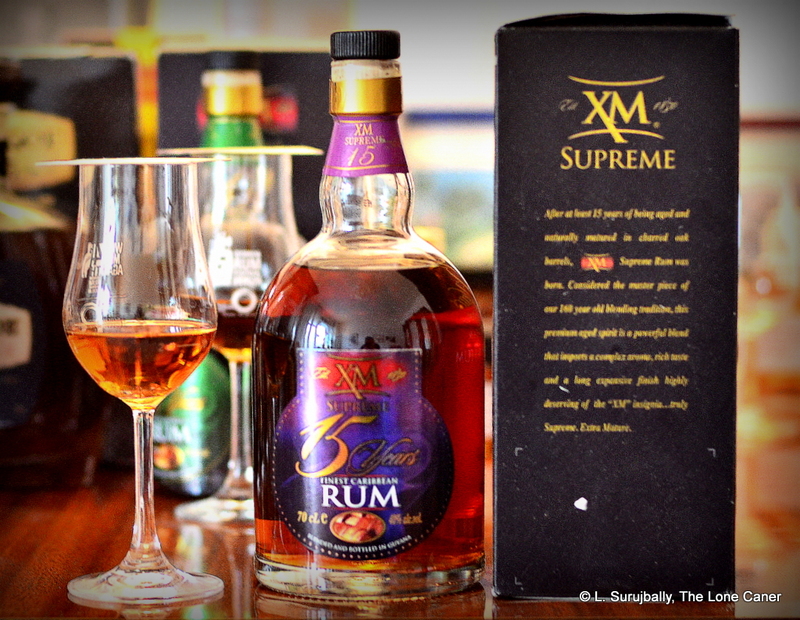 Until the release of the XM Golden Jubilee 20 year old rum in May 2016 for the occasion of Guyana’s 50th anniversary of independence, the jewel in the crown of Banks DIH’s XM line was the fifteen year old. Over the last five years or so it suffered, in my rearview-mirror opinion, by simply following the party line, being bottled without regard for the emerging trend of stronger rums in the minds of the tasting public, and also perhaps from being a indeterminate, mostly column-still blend without a really good barrel strategy. This relegated it to being an outlier in an increasingly crowded and competitive field; and by eschewing any one point of uniqueness that would make it stand apart (finishing, single barrel, cask strength, a singular taste…that kind of thing), it has slumbered in a sort of quiet corner reserved for also-rans – Guyanese worldwide know of it, but few others do and it sure doesn’t make any waves internationally, in spite of its age. Which is something of a shame, because setting aside personal preferences, it’s quite a good rum that could use a good dose of aggressive marketing and festival-circuit promotion. The very first note I wrote down in my tasting book as I was nosing the Supreme, was “Impressive”. It began with aromas of acetone and glue and furniture polish before giving way to very soft notes of dark dried fruit (raisins and plums), before segueing over into the territory of vanilla, caramel and nougat. What little tartness of the fruit that existed, was kept way back, vaguely sensed but not directly experienced, which to my way of thinking is a very good reason to bump up the ABV not just one notch, but several. Still, it was impressive, and for a 40% rum to exhibit such discernible richness was a pleasant surprise. So. The XM 15 is still somewhat generic in nature, but a level up from the 12 year old, and definitely better than the 10 year old. It’s more subtle, a little richer, yet still had much of that laid back profile that simply did not (or could not) strain too much or escape the clutches of its standard ABV. Still, leaving these two points aside, the one major — and perhaps surprising — drawback of the Supreme 15 year old is simply that, good as it is, it remains too similar to the Special 12 year old. I tried all the Banks rums together with a bunch of other forty percenters, and it really was difficult to tell these two apart. So for an average drinking man who’s looking for an aged living room powered rum that won’t incur the wife’s ire, the step up in quality from the 12 to the 15 is slight enough to not make the 15 a better investment outside of bragging rights. It’s a good rum to buy if you have the coin, but don’t look for a quantum leap to the stratosphere if you already have the ten or twelve year olds in stock. The Jubilee 20 year old (my age statement, not theirs) has components of the blend that are up to 50 years old.